Well, Thanksgiving Day is nearly upon us, if you’re like me, you are searching cookbooks, blogs, and old family recipes in order to decide what to make or bring on Thursday. A few months ago (more like six months ago,) I visited my aunt in Houston and we made this delicious Amish Broccoli Bake, which I think, would be the perfect side dish to the turkey and dressing you’re about to eat. Nothing compares to the homemade goodness of the rich and creamy taste and texture of this delicious Amish vegetable casserole. I’m not sure what an “Amish” dish is, but this one was great. The herb stuffing mix added a punch of flavor combined with the freshly grated Cheddar cheese, and creaminess from the soups and mayonnaise. Enjoy and maybe this recipe will make veggie lovers out all those picky eaters. 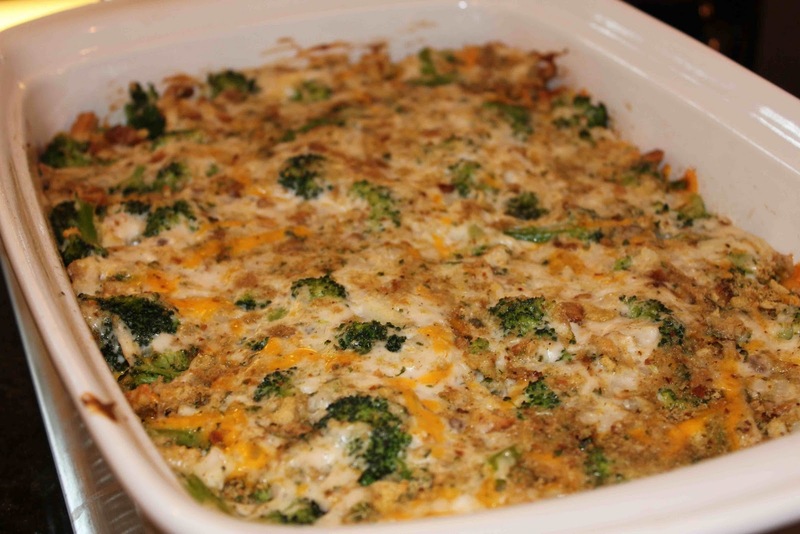 Place half of the broccoli and half of the cheese and stuffing mix in the casserole dish. Pour half of the butter and half of the soup mixture over stuffing. Repeat layers one more time. Bake for 35 to 40 minutes in a 350 degree oven. 1. 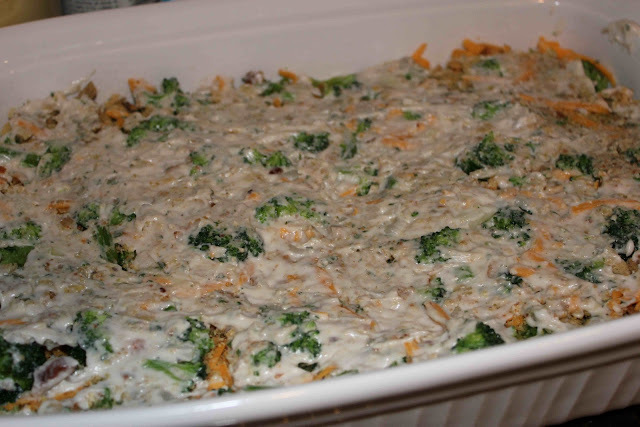 Preheat oven to 350 degrees F. Coat a 3-quart casserole dish with cooking spray. 2. In a medium bowl, combine soup, mayonnaise, onion, salt and pepper; mix well. 3. 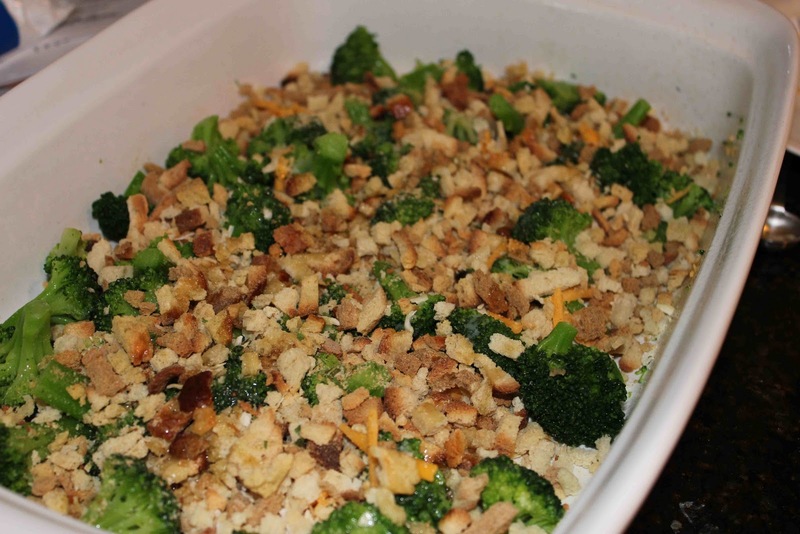 Place half the broccoli in the casserole dish. Sprinkle with half the cheese and half the stuffing mix. Pour half the butter and half the soup mixture over stuffing. Repeat layers one more time. 4. Bake 35 to 40 minutes, or until hot in center.